* Complete recreated by our design staff. NOT just cut and pasted. * Reproduce all flat ink emblems, seals, stamps and logos. 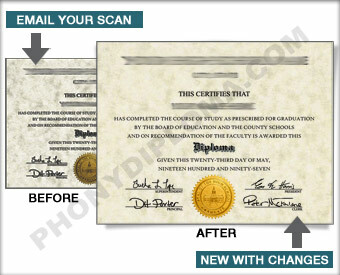 If you need a Raised Gold or Embossed Seal please order Full Custom Diploma, not this Certificate. * Note that we DO NOT reproduce signatures -- we substitute our "house" signatures. * 3-4 Day turnaround before you get your proof. After you have placed your order, send us your scan. Click Here To Send Scan. Please include your order number in the email subject line. We will follow up your order with email and/or telephone confirmation of the details.